This new offering improves the mechanization and automation of the most demanding underground work phases and sets the new standard for sprayed concrete, charging and lifting & installation works in hard rock tunnelling. The new Spraymec Norrunner 140 DC with its long reach spray boom is designed to meet the highest production capacity requirements of Scandinavian sprayed concrete works with an average spraying capacity up to 26 m3/h. It is also capable of accurately spraying water and frost protection linings in a thin layer segment (< 80 mm). Routine service is made easy as all operational access points are reachable from ground level. The optional “smart” boom is a new tool to help the spray operator attain better results with less rebound as its coordinated motion control is linked to concrete pump output. The new Himec and Charmec offerings have rigid frame carriers which provide enhanced driving stability over the articulated carrier used in earlier models. The carriers also have four wheel and crab drive giving better maneuverability in tunnels. The engine in the new carrier is placed on the side of the equipment and therefore all engine and exhaust after- treatment system’s service points are easily accessed from the tunnel floor level. The improved Himec and Charmec models have an optional driving-from-the-basket feature. The operator in the basket can safely and easily move each unit from the work platform. All Himec lifting equipment models can be quickly modified to Charmec explosive charging equipment by adding an ANFO or emulsion explosive charging unit. The new Himec models are available with several single or twin boom configurations. 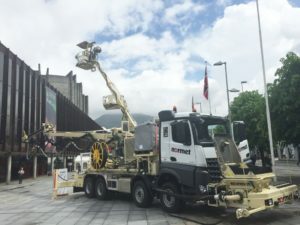 The new generation equipment displayed at the World Tunneling Congress are the Spraymec NorRunner 140 DC and the Himec RM T 125 which has been modified to a Charmec charging vehicle by installing an emulsion charging unit.